How Far Apart Should Furniture be Spaced? Whether you’re rearranging a room, buying a new couch or upgrading your bedroom set, this helpful guide will help you determine how much space you’ll need between pieces of furniture. That way, you can create a functional layout that’s not too cramped. Walkways should be at least 2 feet wide, so make sure furniture doesn’t cramp doorways or hallways, and that there’s plenty of room for traffic to flow through areas like the family or dining room. Leave at least one inch between the backs of furniture and the walls to prevent damage to both. Room-size area rugs should be 12-18 inches away from the walls on each side in a small room, or two feet in a larger room. To calculate the correct rug size, subtract 24-36 inches from the room’s length and width, or subtract four feet for large rooms. Place the front legs of a couch or chair on small area rugs, so they don’t feel like mats randomly scattered around the room. If you will have a couch or chair facing a TV, they should be seven to eight feet apart for best viewing. When two pieces of seating furniture are facing each other, they should be about 3 ½ feet apart. Leave about 16 inches between a coffee table and a couch, to allow plenty of leg room. 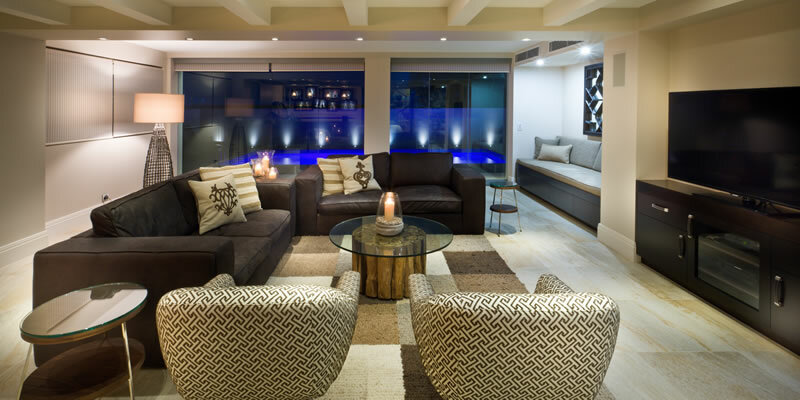 Choose a table that’s within about four inches of the sofa’s height. Select end tables that are about the same height as the arm of the couches or chairs they will be placed next to. Area rugs in dining rooms should extend about three feet beyond the table on all sides to allow room to pull chairs out. A hanging light or chandelier can be anywhere from 24 to 32 inches above the table’s surface. It should obstruct anyone’s view while they’re seated around the table. Avoid banged up walls and keep diners comfortable by leaving at least two feet between a dining chair and a wall. That will allow enough room to walk behind and pull out the chair. Chairs should be spaced about two feet apart. When space allows, place the dining table about four feet from the room’s entrance. Rather than dragging pieces of heavy furniture back and forth across a room to test different layouts, you can measure each piece’s length and width, then tape sheets of newspaper together to get the correct size and create a template for each sofa, chair, loveseat, table or cabinet. Then, you can easily move the paper templates around the room to see how well they fit the space. Since furniture showrooms are quite large, this is also a great way to visualize how a new piece of furniture will look in your home, and if it will fit through doorways, up or down stairs, and around tight corners.